Over this past weekend my dog Emi was outside playing while I was inside cooking. I heard something out outside and I see a pit bull on top of my Emi. I ran out trying to help Emi and get this dog of of her when I finally punched the dog in the right place cause she let go and fell back. Then out of no where another dog comes running and rips her out of my arms by the neck and starts shaking and biting her. Finally the owners come running up tackling their dogs and helped me get Emi free. Apparently the dogs broke through the screen window to attack my dog!!!!! Took Emi to the vet and she was not hurt to bad no stitches, just a couple marks. With Shibas being as sensitive as they are, this can potentially be a long road for Emi to recover from such an attack. I think the best thing now is to be very attentive to her interactions with the dogs and condition her again to know that dogs are still okay to play with and not hurt her. Pay very close attention to her body language and when she starts to get uncomfortable. Praise/Reward her heavily for even doing the smallest type of good interactions with other dogs such as greeting, sniffing, or being calm when another dog walks by her. If you take her to dog parks, I'd avoid it completely until Emi is completely comfortable again since some dogs/owners have no dog park etiquette whatsoever and can even make things worse for her. Only have her interact/play with other dogs in a controlled environment with just 1 or 2 dogs at a time. Positive socialization classes can also be a good aid in helping shy/traumatized dogs as well. Sorry this happened, but I don't understand how other dogs were able to freely get to yours once they were outside? Why was Emi left outside unsupervised if she is not in a safe area? @ashley15 - First off, I am sorry this happened. Dog attacks are scary and can emotionally damage a dog for life. I know, I have been there. Second, it is YOUR responsibility to ensure that Emi is safe. I do not know why she was left outside unattended in an obviously unfenced area, but stop that practice immediately. If you have a yard, fence it in or walk her on a leash. This is why invisible fences and tethers are not effective without 100% supervision. Third, this is going to take time. Probably a LOT of time. And patience. She may never be okay with other dogs, but you can work with her to minimize her reaction to other dogs in her space. There are loads of threads on working with a fear reactive dog already on the forum, so I will not go into detail; you can read through those threads on your own. But basically, you need to work on increasing her threshold with other dogs. Do this slowly, with lots of positive reinforcement. Hopefully this is a temporary reaction, as the stress hormones from altercations can last several days. But if not, be prepared to work with your dog and know that the reactivity may not go away. You may have to deal with a dog-reactive dog. It is not the end of the world, and it is 100% manageable with patience, love, and diligence. I am so sorry this happened. However, I do agree that your little fur baby should not have been left unattended in an unfenced yard. I do know that a dog can remain emotionally scarred for a long time after an attack. My little boy Quakey continues to be dog reactive since the first time he was attacked back in December 2012. However, he now does have some furry friends which he did not have even one year ago so there has been some improvement. Please know your little girl may tend to react negatively towards other dogs out of fear and not aggression. Give her lots of love and positive reinforcement. Look into BAT style training. You will need to desensitize her to dogs again. Slowly re-introduce and teach her that dogs are not something to be feared off the bat. 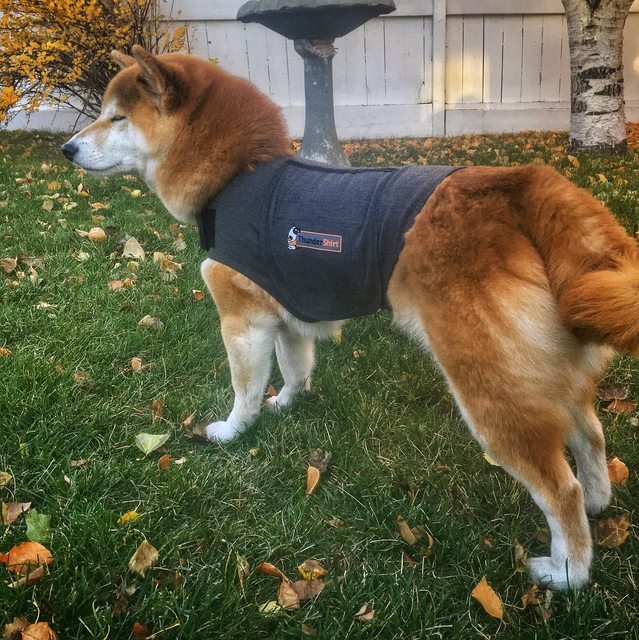 My shiba has the same issue specifically with little dogs because of her being attack at a dog park. Her issue is far worse though because now her predatory drift is kicking in and I am hesitant to still consider it a fear response versus a mix with prey drive. But you do need to go back to training and slowly re-introduce your dog. She might not ever be 100% the same and that is OK. You want to slowly get her used to the idea and let HER be in control with what she feels she can handle. That might mean no more dog parks, always on leash and avoiding certain situations. You don't want to force her into something she can't handle because it will make her fear aggression far worse. I also recommend the BAT style training. We did a version of it called Look at That, where you teach a dog to look at something (first something totally unthreatening) and they get rewarded for it, til a dog understands to look at something you point to, then you, for a reward. You slowly start to do it with scary things but from a safe distance, and eventually a dog understands that the scary things stay away, and that they get rewarded for being calm in the face of such things. (And of course, you have to keep your dog safe, too, and not push them into what they are not ready for). And yes, they remember, and can be scared for a long time. Even just one bad experience, like this, can be a huge set back. Just bumping this thread so I don't go starting another one. After the above story, we spent several days walking them at the same time about 15 feet apart, and eventually together to build up the trust and confidence between them. 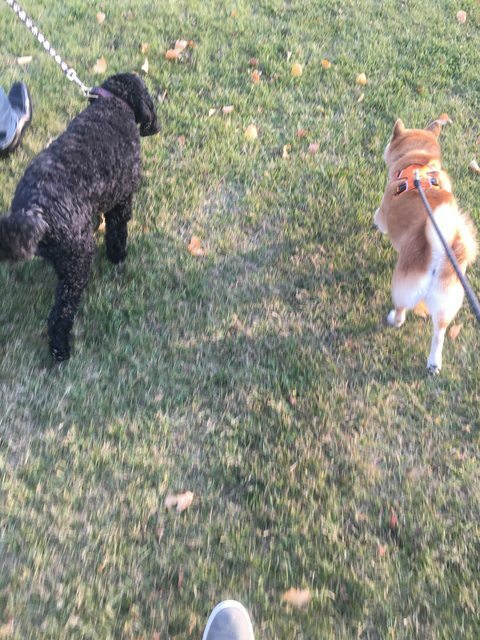 On walks, the two of them are now fine together, mostly because those two seem to ignore each other and just simply... coexist. I've been watching as all the nervous signs slowly went away during their few days of walks (no more "half-moon eyes", no more ears-back). Now they walk fine together (see below picture). I've had her on many walks where we simply avoid other dogs because Kiku gets anxious even when they're across the street or have at least 20 feet between them. My breeder told me that I needed to pick up Kiku every time we pass dogs when on walks, saying that she may still just need to realize that I'm there to keep her safe, and make it clear that I'll take care of her. I've only had one situation where I felt the absolute need to pick her up, when we came across a very friendly boxer on a 20-foot retractable lead that wouldn't give Kiku her space. I picked her up and turned away so he was behind me. I felt like that was the emergency situation that definitely needed it. Maybe this request was more so I can understand how to read HER, but the breeder never clarified that far. In another situation, on a walk with Coda while near a football field, we came across a large group of dogs (various sizes), and while Coda excitedly went in to greet, Kiku started her pulling and growling towards them, so I led her away more into the field, trying some of the tactics from Patricia McConnel's Feisty Fido ("Watch" for treats). When we brought Kiku back next to Coda to continue the walk, I did so very carefully in case she was still seeing red, but when the unknown dogs passed, she was fine next to Coda. It was just a passing moment. Last experience - After the aforementioned walk, we brought them both back into the house. Coda went off leash and I brought Kiku in, removing just the leash (not the harness). I stayed next to Kiku so I could monitor her. Coda went to her bed (exhausted) and started resting under the kitchen table while Kiku ran around the house and explored a little. Kiku eventually made her way into the kitchen and stood over her (I was right next to everyone). She started growling a little, which started to make me a little nervous. I'm still trying to learn the signs of her moods, so I don't want to take any risks. I just grabbed her leash and reattached it, keeping her in another area of the house for the time being, eventually just keeping them separated on different levels of the house so they didn't need to interact while we ate. I think she'd had enough for the day. 1) I'm looking for any other tips on ways to help her focus on me when on walks in these kinds of situations. I recently switched her from her martingale no-slip into a front-range harness (she was pulling so hard that she started wheezing against the collar) and I've been trying to find more high-profile treats (cheese gets her attention, but I wanted to try some other options). 2) Every source material says it's the leash and that they're being leash-reactive, but I just don't want to risk an incident that leaves everyone scarred, so even in the indoor situations, I'm just being cautious. Am I handling this right? I feel like I'm over-parenting her, but I also don't want her to be stressed out because I'm not reading her comfort level around Coda correctly. Any reprimands or tips would be most helpful! I feel like I'm dumping a lot here and trying to overanalyze everything. Maybe someone can smack some sense into me? Don't reprimand, just redirect (the watch me, for example) - you're on the right track. If you reprimand you run the risk of her hiding the warnings, teaching her that the warnings shes giving you are not allowed doesn't teach her to not exhibit the behavior of biting or attacking. She is just doing dog things, giving good dog warnings that things are not to her liking, and it's up to you to do the expected human things of removing / de-escalating the situations. Look in to B.A.T. 2.0 - this is probably one of the best resources out there for people with reactive dogs. The book isn't too pricey, I picked it up for my niece a few months ago and it's done her wonders with her pitbull rescue that has the same issue as your dog - very dog reactive after being attacked at a young age but otherwise a sweet and loving dog. :) Good luck, and know you're on the right track! @spacedogs When my parents first got Coda (their labradoodle), my whole family got on board with the Milan methods of focusing on dominance and submission because it was the trendy thing that was proven on TV. That was about 7 years ago. Coda turned out to be a real sweetheart but looking back at it I'd never put another dog through the same thing. I cringe thinking about having done all those alpha-rolls and having focused on treating Coda as some lower class member of the household who needs punishment when letting us know there's a stranger out the front window. Like you said, they're dogs doing dog things and it's not fair to reprimand them for using their innate tools to let us know what they're thinking. I'm never going to train in that way again. I'll look into the B.A.T. 2.0 resources. I actually had the book in in my Amazon cart when I bought the Feisty Fido book, but I took it out at the last minute because I also wanted to order her a few toys and treats. I've been focusing on pure positive reinforcement training with redirection, starting with the stuff that I learned from the first book I ordered. My second book, BAT2.0, came on Sunday, but I didn't have a chance to open it because I had a sick day yesterday :-&. She's actually come a MASSIVE way since the last time I updated. We went from her being reactive and barking at all dogs we passed when on walk, to now she only starts barking on two conditions - 1) Dog starts barking aggressively at her (only with on leash dogs - she doesn't really bark if they're behind a fence or a window), 2) Dog is white and fluffy - both big or small. When we come across a dog, she gets excited like she wants to go meet them, but I've focused on stopping with her, getting to her level and bringing her attention to me. I try to have her turn away from the dog and have her face right to me as I feed her treats for 'watch'ing me. She's been starting to look back at me first when she sees a dog, but it doesn't always happen. I always mega-reward that behaviour accordingly. Sometimes she's far more excited and pulls a bit towards dogs, but I've been trying to get her to do our routine with as much slack on the leash as possible - I want her to not feel like I'm trapping her into listening and instead that she's listening and getting rewarded for doing that on her own. She's been getting so much better in the past week. I still need to work with her on greetings, because she gets super anxious when she's near another dog. She seems to think all dogs are ready to turn on her at a snap second's notice, so she gets defensive really quick, even if there's zero sign of aggression. I'm working on being patient with her and taking things at her speed. Again, I'm so proud of my girl and how far she's come even in the past week. I'm keeping things consistent and I'll constantly work with her. Hopefully some day she'll be much less anxiety-prone, but even how far she's come gives me hope! She's been slowly getting more accustomed to other dogs being around. I've specifically had her on play dates with a half dozen Shiba friends around my city and I've really started to learn even more about my girl. One of the bigger things I've recently started to pick up on was how she really does read the people around her. If she feels like another owner has their dog on good leash control, passing another dog can sometimes almost be a non-issue. It sometimes seems that she hardly trusts almost any dog - it's mostly up to their owners. She can be 100% fine on leash for the majority of a walk, then get angry-anxious when we stop at the end of a walk and the leashes are more slack. She has a few friends that seem to actually be awesome for (@ryu_ja_crispy and now my parents' dog), and she's actually been getting so much better, but only when we go straight for a walk with the dogs. She doesn't like face-to-face greets, and has gotten snappy with dogs if they're right up in her face, but she doesn't mind being around other dogs if they're both doing their own things. She definitely doesn't play with other dogs. All in all, she's made so much progress. She may never truly be completely comfortable with being off leash (park, backyard OR indoors) with another dog, but she's been doing so much better. I still debate getting in touch with a behaviouralist, but between how much that costs, how little I think she cares for other dogs anyways, and the control and trust we have together, I think we're in an OK position for the time being. We'll keep working on what we've got, push for good experiences with friends, and I'll always have treats on walks so I can encourage her when she behaves amazingly. I can relate to this as my shiba, Fitty, struggles with aggression towards other dogs. As a puppy, he was great with other dogs at the park and at home. Never had a problem. Then we went on vacation when he was only about 4 or 5 months old and we decided to take him to a pet hotel that we paid a lot of money for that claimed he would be in his own private room the whole time. It turns out he would be put in a kennel with others all day but it was too late until we figured this out. Knowing he is sensitive, we would have preferred he be alone as promised. Although the staff did not mention anything, we believe he got into a fight while there. He's very "alpha". The day we got home and picked him up, we noticed a difference. He got into a fight with one of my parents dogs who he had never had a single bad experience with before (who is also another "alpha male" personality). Luckily we were right there to break it up and nobody was hurt but now he cannot even be alone with dogs he has known his whole life. He has since improved with them and will only have a small altercation once every few months which we always are there to break up but we have to take special precautions like feeding them separately. Any strange dog he has ever met he will be aggressive towards. Especially males. He has once gotten along fairly okay with dogs outside in a neutral territory but he still snarls. Once we were at a picnic at my boyfriends parents and we had Fitty on a leash as always and his sister showed up with her pit bull without a leash so he ran down to us and immediately a fight broke out. The pit bull is a sweetie but will fight back when a dog starts against him and that's what happened. It was very bad but my boyfriend reached in to pull them apart and got bit by Fitty (who was definitely trying to bite the pit, he would never bite a human) and luckily not the pit bull because a bite mark would have been much worse. Luckily we got them separated with only a few marks on each but it was horrifying for everyone. We have struggled with this for a year now and it's stressful. You never know when and where someone will have their dog out without a leash! Even if their dog is nice, I wish people would have their dogs on a leash in a public park! We always have to take special precautions to make sure he is far enough away from strange dogs at all times. He lives with us in our apartment now with no other pets so for the most part it's okay but walking him a couple times a day we run into many dogs. Sometimes I feel there is no hope for changing his attitude towards other dogs and we fear we won't be able to get another dog, at least until Fitty passes. But like most shibas, he is enough personality for one household. I hope that those of you with similar stories find a solution because I understand your struggle. And my story is a warning to all pup owners to beware of pet hotels! Not all provide what they promise! We have never went on a trip without him since. You never know when and where someone will have their dog out without a leash! Even if their dog is nice, I wish people would have their dogs on a leash in a public park! @amberroach9 ohhhh man do I know that feeling! Sometimes I feel like screaming "It's not MY dog that I'm worried about right now - if you come any closer with your dog, it's YOUR dog that's going to absolutely regret it right now!"